Shin Godzilla (シン・ゴジラ Shin Gojira, also known as Godzilla: Resurgence) is a 2016 Japanese kaiju film featuring Godzilla, produced by Toho and Cine Bazar and distributed by Toho. It is the 31st installment in the Godzilla franchise, the 29th Godzilla film produced by Toho, and Toho's third reboot of the franchise. Funmation Films: It’s a peaceful day in Japan when a strange fountain of water erupts in the bay, causing panic to spread among government officials. At first, they suspect only volcanic activity, but one young executive dares to wonder if it may be something different… something alive. His worst nightmare comes to life when a massive, gilled monster emerges from the deep and begins tearing through the city, leaving nothing but destruction in its wake. As the government scrambles to save the citizens, a rag-tag team of volunteers cuts through a web of red tape to uncover the monster’s weakness and its mysterious ties to a foreign superpower. But time is not on their side—the greatest catastrophe to ever befall the world is about to evolve right before their very eyes. 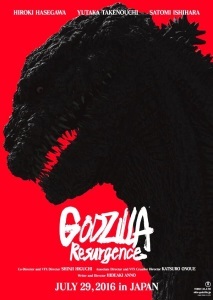 I really enjoyed this one more than any Godzilla movie I've seen since Ishirô Honda stopped directing them. Godzilla: Final Wars in 2004 was fine, but this is much better, I mean if you get as much of a kick out of watching a movie about political infighting and national defense issues raised by a gigantic radioactive monster as I did. That isn't to say the town stomping part and creature design isn't fun too, just that balance of the story is different than usual and I saw that as a plus. I've discovered that I love stories that involve a lot of administration and bureaucracy. This, Locke, The Goblin Emperor. If there's a contentious meeting or a heated phone call, I'm in. Even better if it involves a giant radioactive monster, a fairy empire, or the largest concrete pour in Europe. I love the energy this movie has. It's really put together well. As a professional bureaucrat, I loved this film about a bureaucracy trying to play catch-up with an Out of Context Problem. And the parallels between this and the Japanese government's handling of Fukushima should be obvious, from the high-level bungling to the on-the-site heroics. Where the original Godzilla was a mix of recent memories of World War II and the atomic bombs, this was very obviously dealing with Japan's legacy as a nuclear power itself- and it's uneasy relationship with the U.S.
A knowledge of Japanese bureaucracy and society does help bring out the black humor in this, from the incessant meetings and the PM's carefully pressed emergency uniform, to the universities bringing in senior experts even if they have no clue about the monster, to the subtitles listing the lead character's increasing rank. But over all, the strangely reserved neo-documentary style emphasizes that it's not just about one hero, but about a government trying to piece together a solution to a world-ending threat. not just about one hero, but about a government trying to piece together a solution to a world-ending threat. Agreed. I much prefer this over a single hero who knows and does everything. Still, the endless bureaucracy was very boring but there was just enough Godzilla (super speed evolution for the win) to keep me watching. For the sequel, I hope they show an amusement park or something, built up around Godzilla. I guess they could just dump him back in the water, though. I'm a big fan of the original Neon Genesis Evangelion, and there are so many parallels in the two stories, so I was really looking forward to this film. It did not disappoint me. One of the distinguishing things about NGE, which I was grateful they brought to this project, was this concept of immeasurably expensive, dangerous, and bizarre solutions for apocalyptic problems, and the entire nation sacrificing (and suffering) to try to make them work. I felt delighted by the scenes of the cranes trying to put giant straws in Godzilla's mouth at the same time that I was nervous, and feeling so much loss. The film is very effective at communicating the terror and death being visited on humanity by the enemy, without being gory or explicit. The scene in which Godzilla uses its attack ray for the first time... I'm not sure I can name another example from cinema that made me feel that type of horror, and pity, and awe. Maybe The Thing. The decision to depict different lifecycles for Godzilla added to the realism in a way I never expected. I thought the bureaucratic part was excellent and made sense from a storytelling angle. The humans have a view of Godzilla that must shift repeatedly, and must filter its way through many departments and agendas and people who are protective of their own images before action can be taken, because that's how humans have organized themselves. It's like a representation of ants' fundamentally absurd attempts to comprehend and control a foot that keeps stomping them. I was also thrilled by the soundtrack. I hope things go well enough for Anno and the rest of this team that they feel like making another one. And the parallels between this and the Japanese government's handling of Fukushima should be obvious, from the high-level bungling to the on-the-site heroics. Oh yes, that's completely true, which makes the ending, with the frozen Godzilla draped with the dead still perched in the city all the more disturbing. The analogies to Neon Genesis and other bureaucratic films dealing with large scale problems is also spot on, as the mix of individual heroism and group action, to sometimes limited or counter productive effect, is so much more necessary for stories to deal with than the more usual US version of dynamic individual effort alone being all that's necessary to solve problems. That the movie didn't lapse into pure satire or excessive cynicism about the effort too was welcome. I'll echo the love of this film's Bureaucracy vs giant radioactive beast theme. I was really surprised how well this worked and how well they managed to balance the satire with the destruction. I never thought my favorite moment in a Godzilla film would be when the prime minister is fussing over what uniform he is to wear for a press conference but there you go. Well played Shin Godzilla. I see that one of the co-directors, Shinji Higuchi, also directed the 2 live action Attack On Titan films which worked far better for me then I thought they would. The idea of group effort or team work or collective heroism pops up often in Japanese TV and cinema. I always find it really appealing and offers respite to the more US-centric idea of the individual triumphing over all odds. Is there a good place to find this movie online in the US? It's not available for video streaming or digital rental in most places I've checked. tobascodagama - I picked up the DVD I watched from my local library. Funimation released it in the US and I think they have some kind of in house streaming service. You might want to check that out. In regards to physical media - there's still loads of stuff that is only available physically. But I have a VHS deck, laser disc player and 16mm projector in working order "just in case" so I may not be a reliable narrator. I loved the way the Prime Minister just said "wakatta" over and over. No decisions, no leadership, just the bland "I understand," when he clearly doesn't. Also the best harrowing dental sequence at the end with the trucks. This popped up on Google Play recently, do I finally got around to watching it. Wow, what an incredible movie. I'm impressed at the way it managed to be intensely patriotic without being nationalistic. I mean, the scene where shinkansen are a vital part of the plan to stop Godzilla was not exactly subtle, but as an American it's refreshing to see a country deeply value the creative thinking of its youth and its ability to mobilise its infrastructure and private manufacturing capacity for the common good more than the might of its military. My favorite character was the US liaison to Kaguchi's team, Kayoko Patterson. I loved the way she came off as a brash American stereotype at first but gradually revealed herself as someone who cares deeply about the fate of her grandmother's home country. Just like the rest of the film, her character strikes just the right balance of optimism without sliding into naivete. What was with that final image of the tail, though? Are we to understand that Godzilla was shedding smaller copies of itself this whole time? There is no definitive answer as to what the deal is with the tail. When I saw the movie on my crappy screen I just thought they were some of the bodies of the dead involved in stopping Godzilla, but the screenshots clearly suggest something more than that. The idea Godzilla was evolving to be like men seems a reasonable guess, especially if there was no sequel planned. If there was, then something more intricate may be involved. Whatever the case, it was an effectively chilling ending to the film. Yeah, it's an incredibly creepy image to end on. And it works both as a memorial to the dead and a foreboding teaser of things to come. Multiple characters refer to Godzilla as a literal god, even as they're working to stop him, so why wouldn't he be taking the dead into him and remaking them in his image? Especially when his whole nature seems to be the transmutation of one thing into another. I recall that when Yaguchi's team finally deciphers Goro Maki's mysterious paper document they discuss the fact that Godzilla can survive anywhere he can find hydrogen and oxygen, because the reactor in his body can turn those elements into anything else he needs. Also, just another side thing, I loved that the "Decisive Battle" music from Evangelion played such a prominent role in this movie, alongside the traditional Godzilla march.